Does anybody remember Intestine Baalism? Or their 1997 debut An Anatomy Of The Beast? Anyway, the four Japanese death metalheads are back after 6 years of silence. In that period line-up changes took place. One of the reasons for the long delay. In Jiro Ho (guitar) and Hisao Hashimoto (drums) they found in late 2000 two new dedicated members, the basis for a stable line-up. In 2001 they played live a lot. Finally they are back! On Banquet In The Darkness they present mean death metal with deep growls, but the breaks, the slower, more melodic parts built a nice counterpart to the fast death metal, e.g. The Genuine Tone. Technically on a high level the Japanese offer songs which could also be interesting for open-minded metal fans, only the typical death metal growls will keep them in the genre boundaries. 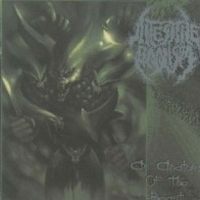 For the death metal fans Intestine Baalism is a very interesting band which had already found their own sound / identity. Perhaps not a must-buy, but close to it and so I can just recommend to check out Intestine Baalism!